Razer’s first entry into the smartphone arena, the Razer Phone, may not have caused too much of a stir in the mainstream media but that did not stop it from being well received by the more discerning smartphone user and reviewer out there. 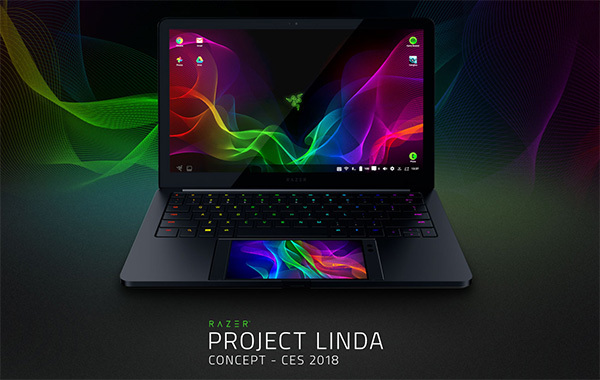 With CES 2018 now firmly underway, Razer is seeking to bring the wow factor to the show floor, showing off Project Linda, the company’s attempt to marry the Razer Phone with a notebook computer. Of course, the idea of a smartphone turning into a computer is nothing new, and Motorola tried this years ago with the Atrix, but what makes the Razer attempt so interesting is the fact that Razer chose to not just have the smartphone be the part that does the heavy lifting but also the part that acts as an input device, too. With the Razer Phone docked, it becomes the trackpad for what immediately becomes one of the dopest laptop computers we have seen in a long, long time. The notebook computer, if you can call it that, is essentially a modified version of Razer’s Blade Stealth notebook. Where things really change though is when you slide a Razer Phone into its dock where a trackpad would be on any other computer. Once in, you press a button and a USB-C port extends directly into the phone, locking it in place and providing power and an interface to the notebook itself all in one fell swoop. The machine is powered entirely by the phone, with Project Linda itself only offering an additional 200GB of storage and extra battery power. Oh, and a screen, of course. Once docked, apps etc. behave as if they would on an Android tablet, which has its own problems, but Google continues to work on that. Razer isn’t saying when or if it’s planning to bring it to the market, and if it did, we do wonder how big the market for such a thing would be, but we do know that we’d want one!